Oedo Tokyo Ondo (大江戸東京音頭) is one of new Bon Odori song. It is the remix version of Tokyo Ondo. 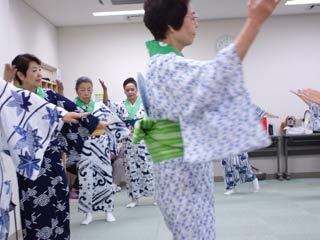 However, the dance is very speedy and different from Tokyo Ondo. Step right foot and bend you knees, and hug. Step back and make a circle in front of you. Three steps from right foot. Stretch your right arm and touch its upper arm by left hand. Put your right foot down and swing right hand forward just like sweeping hair. Bend your knees, and the other side. Step right foot back. Step right foot and draw mt. Fuji. Step right foot back. Put fingers straightly up. Right hand out and left hand in front of your chest. Step and the other side. Three steps from right foot and open arms. Put palms up and step right foot. Step back and swing arms and put them back. Oedo Tokyo Ondo has the finish. It finish with Yosakoi Posture. The music get faster so that you can see the end is coming. Step right foot to the center of the circle, and cross hands like this. Step back and open your arms. Left hand forward, and right back.